(Minghui.org) Falun Dafa practitioners participated in the 31st annual Granny Smith Festival in Sydney’s suburb of Ryde on October 15, 2016. Drawing more than 90,000 spectators, it’s is the largest annual event of its type. Practitioners have participated in this festival since 2000. The Australian Broadcasting Corporation (ABC), a state-owned national public broadcaster, has listed the Falun Dafa waist drum team on its web page to promote the community festival. The Tian Guo Marching Band, waist drum team, and a float with practitioners demonstrating the exercises were once again a highlight of the program. Spectators wave to practitioners on the float. Jane Stott, deputy mayor of Ryde, said, “This band is unique. From their uniforms to their music, everything is excellent.” On the city’s web page, a picture of the band’s performance was used to publicize this event. Jane Stott (deputy mayor of Ryde, fourth from left in the front row), John Alexander (Member of the Australian Parliament, first from left in the front row) and many government officials who came to the event had high praise for the Falun Dafa group. John Alexander, Member of the Australian Parliament, agreed. He has received requests from practitioners urging the Australian government to take action to stop the ongoing suppression of Falun Gong in China. He said it is a severe human rights violation and what the Australian government has done so far is not enough. Lisa Clarke from the Australian Broadcasting Corporation International wrote an article on this event, which included photos of the Tian Guo Marching Band, waist drum team, and the float. The report was carried by several other news media outlets, including Republika, a national daily newspaper in Indonesia. (Minghui.org) The streets of the Asian community of Eastwood, a suburb of Sydney, Australia, were lined with local Falun Gong practitioners raising awareness about their peaceful spiritual practice and the persecution it endures in China on June 11. 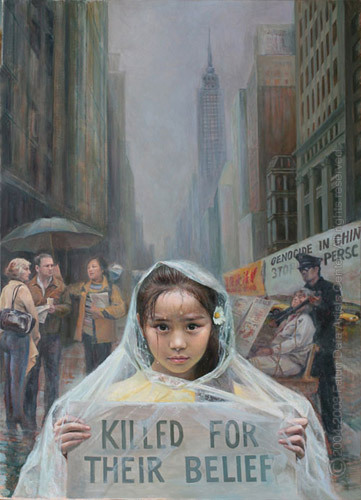 Many people were shocked to learn about the ongoing organ harvesting atrocities targeting Falun Gong practitioners and other prisoners of conscience. Falun Gong practitioners in Sydney held activities in Asian community of Eastwood. Bernadette (middle) and Nicole (right) sign a petition calling for an end to organ harvesting. She said she sees practitioners’ activities and peaceful protests in many places, and always supports them. She’s even told others about it and asked them to sign the petition. Falun Gong practitioners have been exposing the persecution and helping people withdraw from Communist organizations in Eastwood every weekend. More and more Chinese people are learning about the persecution. Newly immigrated Chinese eagerly take the informational materials so they can know the truth about what’s going on in China. (Minghui.org) Falun Gong practitioners recently held a photo exhibit and signature drive in Eastwood in Sydney. They held banners and posters depicting the brutal torture methods the Chinese Communist regime uses to persecute Falun Gong practitioners in China. They also collected signatures in support of the lawsuits being filed against former head of the Chinese Communist Party (CCP) Jiang Zemin for initiating and directing the persecution of the spiritual practice. More than 200,000 Falun Gong practitioners and their family members in China have filed criminal complaints against Jiang with Supreme Court and Supreme Procuratorate since May 2015. Many local residents who passed by were touched by the practitioners’ effort. A local Chinese couple said, “You’ve come out on such a hot day to raise awareness. We support your effort to end the persecution!” The event took place on December 19, 2015. Mr. Kari took a brochure and stayed to learn about the CCP’s persecution of Falun Gong and its state-sanctioned forced organ harvesting. He said it was the first time he had heard about how brutally the CCP persecutes cultivators who live by the principles of Truthfulness-Compassion-Forbearance. “It’s unreasonable,” was his response. When he heard about the movement to sue Jiang Zemin, Mr. Kari said that the former dictator should be brought to justice. He was sad to learn that many prisoners of conscience in China, including Falun Gong practitioners, are still imprisoned and risk being killed for their organs at any time so that the regime can meet the demands of its transplant industry. He said that he would download and watch the documentary “Human Harvest” broadcast on SBS TV to learn more about the CCP’s atrocities and bring the persecution to an end as soon as possible. Mr. Chen and his wife sign a petition in support of Falun Gong practitioners’ effortsto end the persecution. Mr. Chen and his wife signed the petition that calls for Jiang to be brought to justice and for an end to the forced harvesting of organs from living Falun Gong practitioners in China. The couple said that they appreciated what Falun Gong practitioners are doing, all of which are good things. They wanted to sign the petition to show their support and help stop the persecution. Greetings, esteemed Master and greetings, fellow practitioners! I found out about Falun Dafa in late April 2015 when I was asked to sign a petition in Sydney’s central business district. An elderly woman approached me with a petition and I planned to avoid her, but decided to stop. Then, she suggested that I read Zhuan Falun, which would help me understand the meaning of life and what we live for. This sounded incredible, yet it was a response that resounded in my mind. It was a way to find answer to many questions I had and made me want to learn more about Falun Dafa. Before I practiced Falun Dafa, I was baptized in an Anglican Church in Australia. I made many friends and was active in church activities. While a member of this church, my English improved and I learned some social skills important when living in Australia. I held the thought that God blessed me with such a wonderful new life. I had a great longing for a bright future, and no longer felt lonely. However when I had reached this lifestyle I heard about Dafa, a practice that provides me with answers to my spiritual questions. Therefore, I read Zhuan Falun online, and it captivated me so much that I would stay up an extra few hours reading it. Every sentence inspired and many incidents that happened in the past seemed to make sense. I believed that everything was arranged in my past and that Master Li already took care of me, even before I practiced Dafa. After having only slept for three hours that night, I was not tired. Instead, I felt that my heart was filled with happiness and gratitude. A strong energy field surrounded me and my mind was filled with the Fa. Although I had read Zhuan Falun and knew that Falun Dafa is good, I was still beholden to Christianity, out of sentimentality. However, the more I studied Master’s Fa teachings, the more I understood the seriousness of cultivation and the difference between religion and Dafa. I continued to read the Fa, and my personal notions were gradually rectified. After I read Master’s quote, I felt that these words were directed at me and that Master knows everything. After reading the Fa some more, I understood the principle that one must cultivate in only one school. Therefore, I made up my mind to practice only Falun Dafa. After I practiced Falun Dafa, my mom and I could end our years of hostility. We have not lived in harmony from the time I was old enough to talk. We both thought that we hated each other and could not have a normal conversation. Despite my two years of church practice, our relationship had not improved, and it actually got worse. I could not bear her behavior and she held a dislike for me. However, Dafa made me realize that I was very stupid and selfish in this mother-and-daughter relationship. I complained a lot about things, and was upset that I could not enjoy a gentle and soft mother’s love. I only thought about myself. Now, I feel ashamed about my attitude towards her and apologized. “Mom, I am so sorry that I have hurt you so much before. I was just naive and selfish. Please forgive me. Falun Dafa is really good. You should read this book,” I said. My mom was shocked because she had not expected that I would apologize to her. Then, I encouraged her to also practice Falun Dafa. In the past she was not interested and did not want to talk about Dafa, but now because of the changes in me she changed her mind. “If Falun Dafa can change you into such a different person, then I will also believe in it,” she said. Three weeks after reading Zhuan Falun. I became involved in talking to people about Dafa. I was rather nervous and worried that I would be snubbed by people. I begged Master in my mind to give me courage 10 minutes before I went out. I walked up to the first person and told him about the Communist regime’s crime of harvesting organs from living practitioners in China. It went smoothly although I did stammer because of my limited English and out of stress. Then, I started to feel confident. However, it became more difficult after I gained confidence. Some people ignored me, some said no, and others looked disgusted when I approached them. Yet, it was amazing that I did not feel upset or angry toward these people, instead I felt compassion because their human notions stopped them from learning the facts about Dafa. Master guided me and I was able to treat people kindly despite their adverse behavior. It was such an unbelievable and precious experience for this new practitioner. I no longer felt awkward during signature drives because I knew that I assisted Master in the Fa-rectification. For a new practitioner it is important to associate with fellow practitioners and learn from them how to do better. I began to read the English version of Zhuan Falun. It helped me acquire the vocabulary I needed when talking to people about Dafa in Australia. My next goal is to learn from the English language Dafa book “The Great Way of Spiritual Perfection” simple but standard expressions, so I can teach the exercises, as well as having the vocabulary to answer simple questions about the practice. To teach people the exercises during weekends I go to a park and also teach some friends of mine at home. Although some practice other qigong, they felt a strong energy field after doing the Dafa exercises and became interested in Dafa. In writing this sharing article, I sensed the preciousness of Dafa cultivation. I am deeply grateful for Master’s guidance. “Strive forward with every effort until Consummation.” ( “Enlightenment,” Essentials for Further Advancement). I will be more diligent on my cultivation path, let go of attachments and assimilate to the Fa. I want to be a good person and become better in the future. Thank you Master. Thank you everyone. (Minghui.org) Falun Gong practitioners who were attending the cultivation experience sharing conference in Sydney held a grand march in the downtown area on September 4, 2015. The march, led by the Divine Land Marching Band, began at Hyde Park, proceeded along Park and College Streets, and ended at Domain Park. The procession included three teams, themed in “Falun Dafa is Good,” “16-Year-Long Peaceful Resistance,” and “Supporting the Chinese Withdrawals from the Communist Party.” Practitioners also performed waist drums and demonstrated the exercises. Falun Gong’s march in downtown Sydney. Many people saw the march, as it was held during the lunchtime hour on a weekday. Spectators took videos and photos, accepted Falun Gong informational materials, and signed a petition to support Falun Gong’s peaceful resistance to the ongoing persecution in China. Philip Nat, a computer engineer, said he had seen many Falun Gong activities in multiple cities, but he had never seen such a large-scale march. Local banker Kiashe Genan knows well about the persecution of Falun Gong in China. He said that suppression of a peaceful group by the government is horrible, especially the state-sanctioned organ harvesting from Falun Gong. Union member Geff Carit was attracted to the Falun Gong meditation. “I am learning meditation, and I am happy to see it in the march. I heard about the persecution of Falun Gong, but I didn’t know that Falun Gong includes meditation. Had I known it, maybe I would be in the march too,” he said. “Truthfulness-Compassion-Forbearance is a great truth. I will learn more about it from the Internet, and share this with my friends,” Geff said. A young man from Taiwan followed the march along the entire route, and talked to practitioners for a long time after the march. He heard about Falun Gong in Taiwan, but he thought it is just a qigong practice, and didn’t understand why Falun Gong seemed to be involved in politics. (Minghui.org) Many doctors and attendees of the 12th Congress of the International Society of Organ Donation and Procurement (ISODP) signed the petition to help stop forced organ harvesting in China. Even during the pouring rain on the afternoon of November 22, they stopped and signed the petition. They didn’t mind the hassle or getting wet. A doctor from Japan told Falun Gong practitioners that Chinese doctors made a presentation to deny the charges of involuntary organ harvesting in China on the first day of the conference. He volunteered to distribute practitioners’ materials to the participating doctors to spread the truth. The 12th Congress of ISODP was held in the Sydney Convention Center November 21-24, 2013. Falun Gong practitioners in Sydney set up tables at multiple locations, such as downtown Sydney, in front of Town Hall, and in Chinatown during the four-day meeting, collecting signatures for a petition calling for an end to forced organ harvesting from living practitioners. Some of the attendees had heard about what is taking place in China from the organization “Doctors against Forced Organ Harvesting” (DAFOH) and other channels and had signed the petition in their local areas. More of them learned about forced organ harvesting by studying photo displays during the conference and speaking to practitioners. They signed the petition and expressed their support for an end to the crime of forced organ harvesting in China. A doctor from the Northern Territory of Australia told the reporter that he had heard about this horrible practice and signed the petition. Another doctor who signed the petition told a practitioner that he declined an opportunity to go to China to give a speech after he heard about the forced organ harvesting atrocities being committed there. A doctor and his assistant from Argentina learned about the forced organ harvesting in China for the first time. Alarmed and indignant, they approached the practitioners’ booth in front of Sydney’s Town Hall and signed the petition. They also took photos in front of the banner that practitioners held. They said they were duty-bound to tell their friends about these atrocities. Some young people in Australia also signed the petition and promised to spread the information widely. Lola and Christine were very indignant after they heard a practitioner explain the situation to them and said they would definitely sign the petition to save lives. They would also post the information on their Facebook pages so that more people would learn about it. Three high school students signed the petition to express their support and said that they would also widely spread the news on their Facebook pages. They said they would recommend that their principal include the information in an open letter to the school, so that their friends and relatives would learn about it and sign the petition to express their support. A doctor from Japan told a practitioner that he supported their efforts and would take informational materials to help distribute among doctors inside the convention center. He also told the practitioner that a Chinese doctor denied Falun Gong practitioners’ allegations on forced removal of organs in a speech during the first day’s meeting. The practitioner explained to him how the Chinese regime lies to deceive the public. He said that China recently announced its intention to phase out the harvesting of organs from executed prisoners by 2015 and to introduce the China Organ Transplant Response System (COTRS), a computerized organ-allocation system. However, DAFOH released a statement on Minghui.org on September 16, 2013, that revealed the regime’s announcement to be a lie. DAFOH recalled that, in 2007, the Chinese Medical Association (CMA) pledged to the World Medical Association (WMA) to end the harvesting of organs from executed prisoners. Six years after China made that pledge, it still has not ended the practice and continues to perform more than 10,000 transplantations every year. Today, the Chinese regime only offers an indefinite timeframe—to “phase out” the practice. DAFOH commented that China’s recent announcement is only empty talk, yet another lie to fend off pressure from the outside world. With more people becoming aware of the Chinese regime’s criminal acts, this awareness will help people see clearly the Chinese Communist Party for what it is and help put this crime against humanity to an end. The signature drive during the 12th Congress of ISODP is one part of the ongoing global signature collection drive initiated by Doctors Against Forced Organ Harvesting since June 2013. The petition will be submitted to the UN Human Rights High Commissioner to pressure the Chinese regime to immediately stop the forced organ harvesting from Falun Gong practitioners in China. As of the end of October, 800,000 signatures have been collected. Thousands of medical doctors and professionals signed the petition, condemning the unethical forced organ harvesting.